April 24, 2018 — The biggest Czech aircraft manufacturer with an unparalled background of supplying proven military light jets around the world, AERO Vodochody AEROSPACE a.s., and world leader in defense systems technologies, Israel Aerospace Industries Ltd., signed a partnership agreement relating to technical and marketing cooperation for the light combat L-159 aircraft. 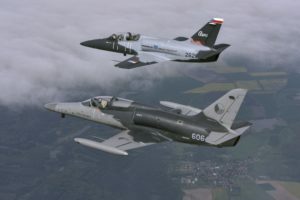 The cooperation draws on the tradition and experience of Aero Vodochody in the field of military light jet aircraft, the L-159 proven robust platform which has been successfully operated and tested in NATO joint operations, Red Air exercises and real combat missions, and IAI’s innovative and cutting-edge technologies. The partners have agreed to integrate new state-of-the-art avionics and other solutions, on the L-159 platform , and to jointly market the aircraft. This approach is focused on further strengthening the already proven L-159 and enhance its position in the light attack market. Giuseppe Giordo, Aero Vodochody President & CEO said: “Together with IAI, Aero will be ready to offer aircraft with the best available technology. The agreement brings us together with a strong international partner with access to new potential customers. Joseph Weiss, Israel Aerospace Industries President & CEO said: “The cooperation with Aero Vodochody opens up new and exciting oppertunities by combininng the impressive proven performance of the L-159, with new innovative IAI systems, to provide customers with aircraft that meet their future requirements”. AERO and IAI have agreed also to collaborate on enhancing pilot training by integrating IAI’s virtual training solutions as part of the overall L-39NG training system. The L-39NG is now the only platform on the market capable of meeting most of the pilot training syllabus including advanced portion. This will be of benefit to customers that decide to use only one platform for pilot training and also for customers that retain the two platforms approach, by reducing the number of advanced trainer aircraft resulting in significant cost reduction. The L-159 aircraft brings together Aero’s long and proven experience in development and production of military jet aircraft, in which field Aero is historically the largest producer in the world, together with the latest advances in avionics, engine and aircraft systems technology. The L-159 is a light multi-role combat aircraft designed for a variety of air-to-air, air-to-ground and reconnaissance missions. The aircraft is equipped with a state-of-the-art multi-mode IAI (Elta) radar for all-weather, day and night operations, can be equipped with IAI Real Time Tactical combat proven Data Link supporting a high capability of Situational Awareness presentation and can carry a wide range of NATO standards stores including air-to-air and air-to-ground missiles and laser guided bombs. The two-seat L-159 is a derivate of the single-seat L-159, primarily designed for Advanced and Operational/Lead-In Fighter Training. The L-159 configuration can also be tailored to customer specific requirements and adapted to needs of basic training as well as combat missions including air-to-ground, patrol and reconnaissance missions – all supported by advanced planning and debriefing station. AERO Vodochody AEROSPACE a.s. focuses on the design and manufacture of military and civil aircraft and is the largest aircraft manufacturer in the Czech Republic and one of the oldest aerospace companies in the world. In the field of military aircraft, Aero has been a reliable long-term partner to many of the world’s air forces and it has a strong position in the market of military training and light combat aircraft. With a huge existing fleet of L-39 and with the brand new L-39NG aircraft, Aero is positioning itself as a leader in the jet training market. In the field of civil aviation, Aero partners with many of the world’s largest manufacturers in a diverse range of projects. More recently, Aero is a full partner in several risk-sharing programs, taking responsibility not only for the production of structures but also for their development.